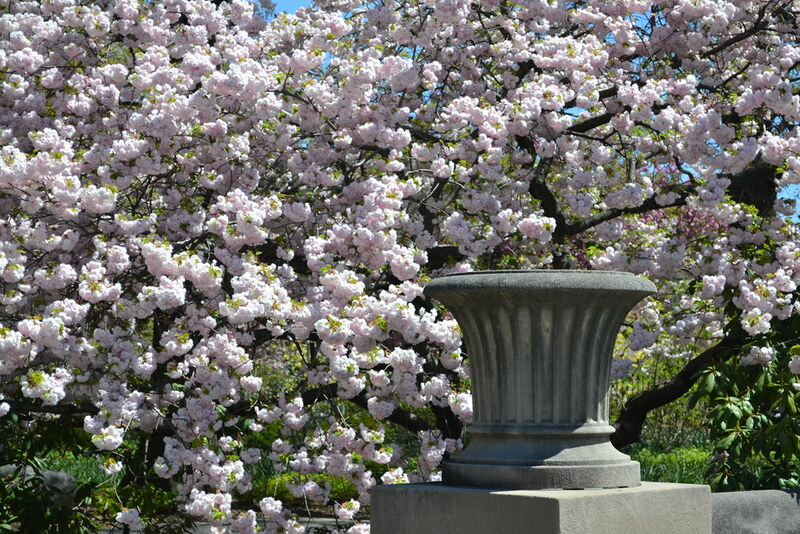 Flowering cherries bloom at the Garden from late March or early April through mid-May. The very first cherry trees to blossom usually do so at the same time that the daffodils bloom. So when you see daffodils throughout the Garden, look for Prunus 'Okame' in the Cherry Cultivars area and Prunus hirtipes in the Plant Family Collection. The rest of the cherry blossoms will appear in the four or so weeks following this first bloom. Temperature, precipitation, and other variations in weather all contribute to the timing of the blooms. These same factors determine how long they will linger. 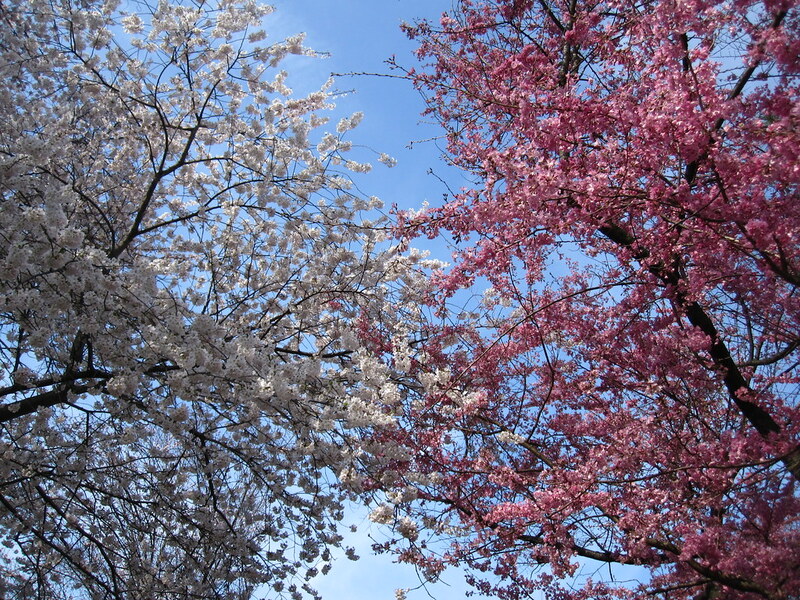 More: Learn more about the art of predicting cherry blossoms. No one tree remains in flower for more than a week, and there is no moment when all are blooming at once. Instead, different species and cultivars blossom in succession, allowing many opportunities to savor the season. Flowering cherry varieties are located throughout this enclosed garden. Early in the cherry blossom season, the delicate weeping higan cherries (Prunus subhirtella 'Pendula') that border the pond offer a tranquil panorama. These are some of the oldest trees in the collection and display great character with their knobby branches and thick trunks. More: Take a virtual tour of the Japanese Hill-and-Pond Garden during cherry blossom season. Here you’ll also find a winter-blooming cultivar, P. sargentii ‘Fudan-Zakura’, which flowers intermittently during mild winters. Two of the collection’s sweetest-smelling trees, P. ‘Shirotae’ and P. serrulata ‘Taki-Noi’, are located near the viewing pavilion. A late flowering cultivar near the waterfall, P. serrulata ‘Ukon’, has unusual pale-green blossoms. A dozen different varieties of flowering cherries are planted just west of the Japanese Hill-and-Pond-Garden near Cherry Walk. This display provides a wonderful opportunity to observe different forms of blossoms and bloom times. Here you will find Prunus ‘Okame’, usually the first cherry to flower at BBG. 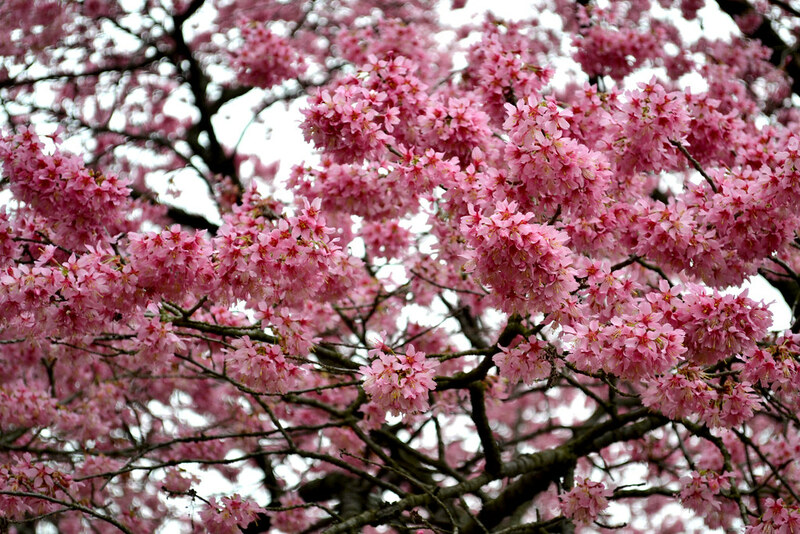 Its bloom signals the start of hanami—the cherry-blossom viewing season. Another highlight is the white Yoshino cherry, Prunus x. yedoensis, the favorite in Japan, where delicate, simple forms are highly valued. Yoshino cherries are seen all over Tokyo. One of the last trees to bloom, P. ‘Kurayama’ is also found here. It features showy, pale-pink clusters of double blossoms. This meandering path located to the east of Cherry Esplanade is lined with extravagant, pink-flowering Prunus ‘Kanzan’ trees that form a delightful bower near the end of cherry blossom season. 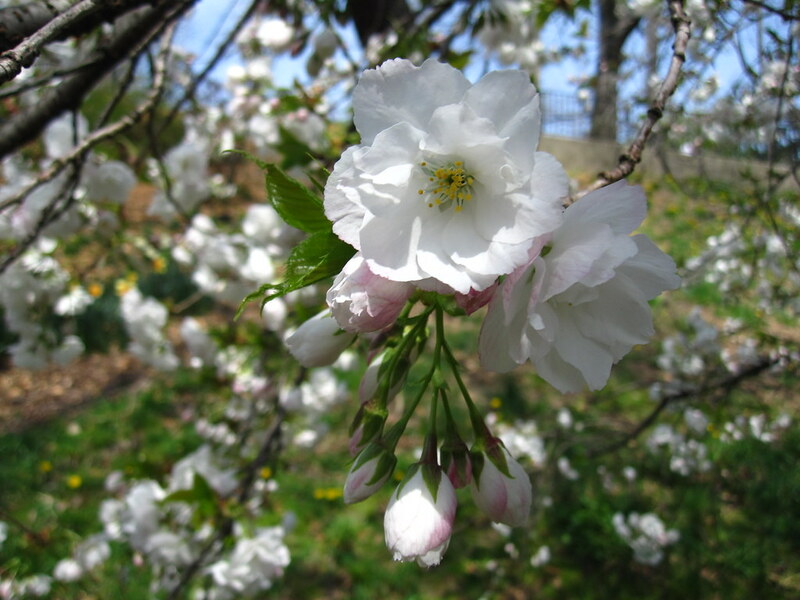 While most cherry blossoms have 5 petals, 'Kanzan' is a double flowering cultivar with up to 28 petals on each bloom. 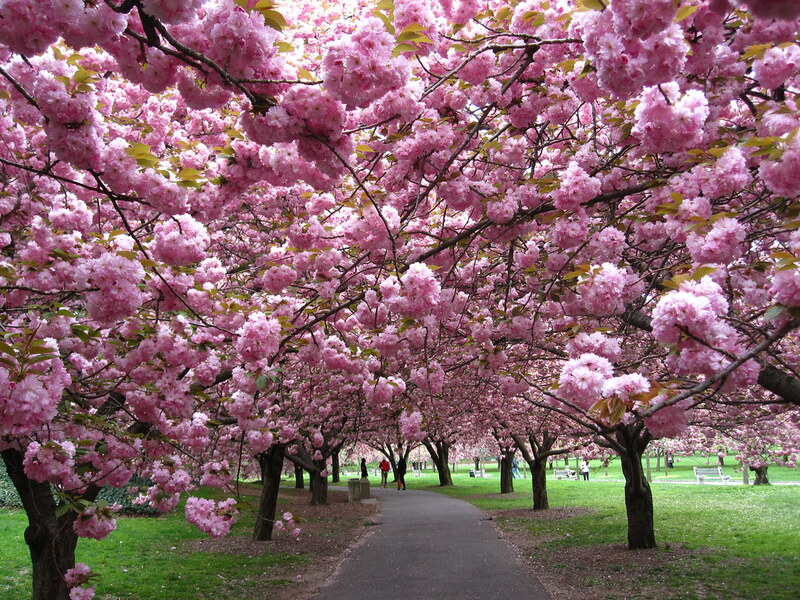 Cherry Walk was created in 1921 with trees purchased from a Long Island nursery. The two higan trees at the north end of Cherry Walk date back to this original planting and are the oldest in the collection. The dazzling finale to the cherry blossom season takes place on this open lawn lined with two allees of Prunus 'Kanzan'. You may notice some younger trees among the 76 specimens here. Cherry trees typically live 25 to 30 years, and those that succumb are replaced immediately. 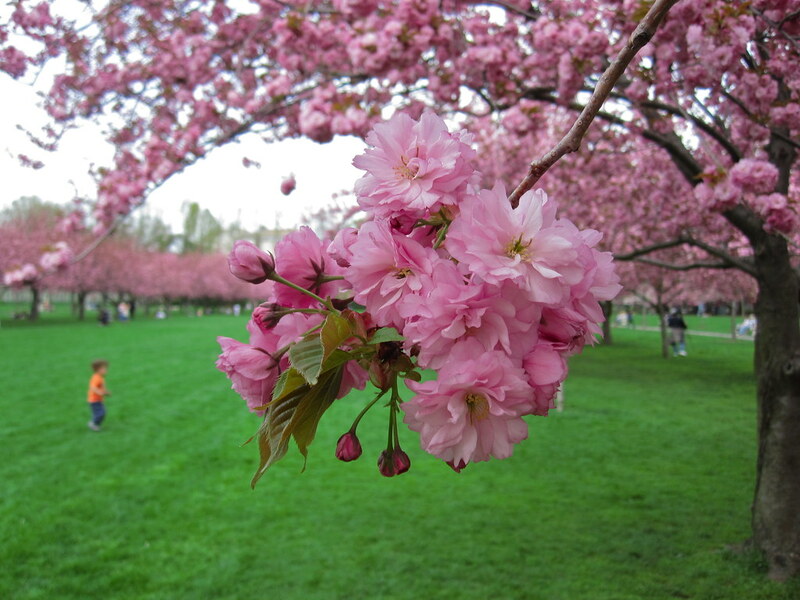 More: Take a virtual tour of Cherry Esplanade during cherry blossom season. Several varieties of flowering cherries and related species (see below) are found on the Plant Family Collection's Prunus Lawn, in the central area of the Garden west of the Palm House. 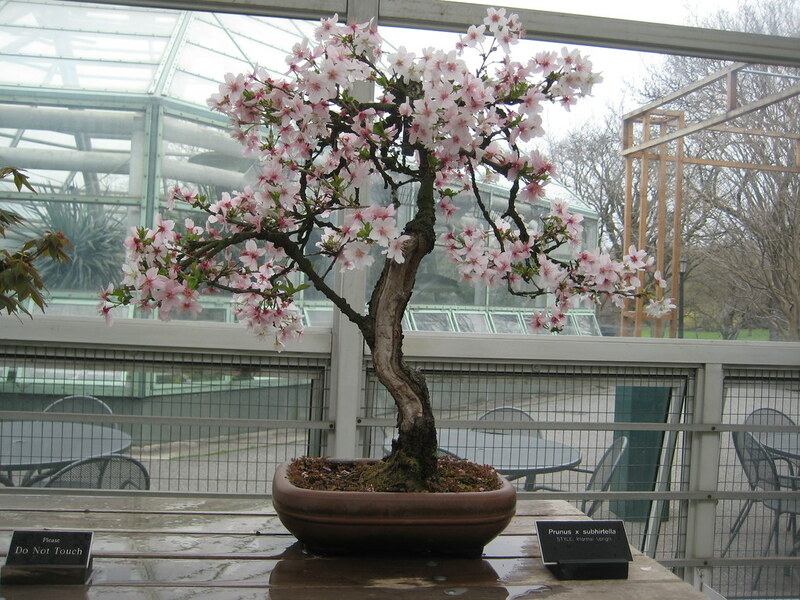 BBG’s Bonsai Collection includes about a dozen cherry trees, which are displayed when they are in bloom. You’ll also find cherries planted on the Overlook slope, along Washington Avenue, at the Washington Avenue Entrance (across from the Gift Shop) and near the Fragrance Garden. Prunus is a large genus that contains many well-known stone fruits besides cherries: peaches, apricots, almonds, and plums. Some Prunus species have inconspicuous flowers or more shrub-like forms. Others are bred for ornamental value. 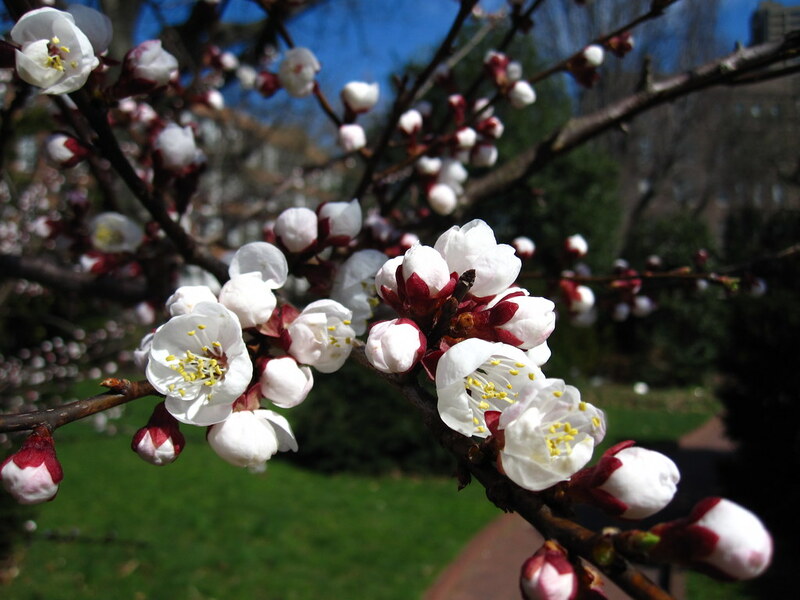 At BBG during cherry blossom season, look for the showy flowers of Prunus armeniaca (apricot) and P. glandulosa (almond) in the Shakespeare Garden, P. davidiana (peach) west of the Annual Border, and P. mume (apricot) specimens in the Bonsai Collection. Many other trees flower in the spring, too, so look for the plant label if you want to know exactly what you are seeing. Magnolia Plaza is usually in bloom along with the earliest cherries. 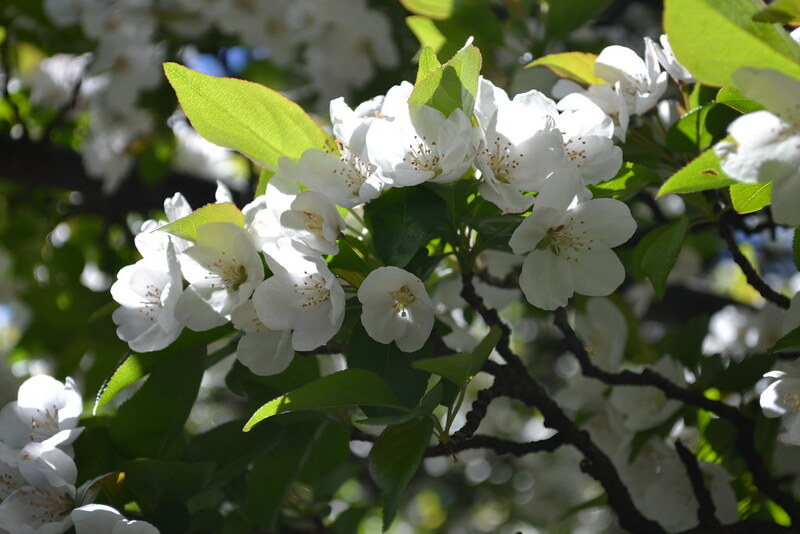 Pears (Pyrus species) and apples, including crabapples, (Malus species) bloom later, with flowers that look very similar to cherry blossoms. Prunus subhirtella blooms in the C.V. Starr Bonsai Museum. Photo by Sarah Schmidt. Prunus 'Kanzan' in bloom on Cherry Esplanade. Photo by Rebecca Bullene. Prunus 'Okame' blooming in the Cherry Cultivar Area at BBG. Photo by Elizabeth Peters. 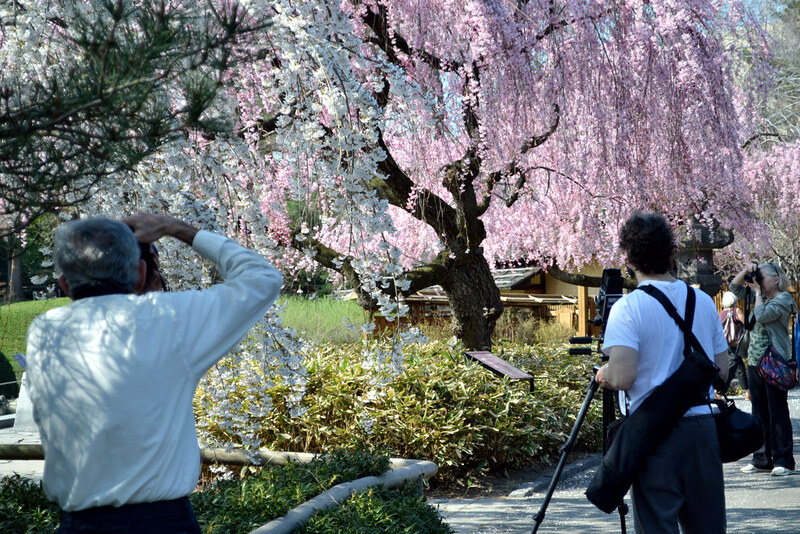 Photographers can't resist the weeping Higan cherry trees in BBG's Japanese Hill-and-Pond Garden. Photo by Elizabeth Peters. Prunus serrulata 'Shirotae'. Photo by Rebecca Bullene. Prunus serrulata 'Shogetsu' (Japanese flowering cherry cultivar) at the entrance to the Osborne Garden. Photo by Elizabeth Peters. Prunus armeniaca (apricot) in the Shakespeare Garden. "Go bind thou up yon dangling Apricocks, which like unruly children, make their sire stoop with oppression of their prodigal weight." -Richard II, III, iv, 29. Malus 'Sugar Tyme' (crabapple) blooming in the Osborne Garden. Photo by Elizabeth Peters. The Prunus 'Kanzan' trees along Cherry Walk. Photo by Rebecca Bullene. The white flowers of Prunus x yeodensis 'Akibono' mingle with the pink petals of Prunus subhirtella 'Rosy cloud'. Photo by Rebecca Bullene.